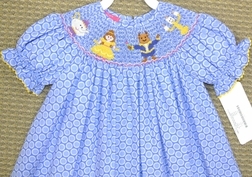 Here we have Claire & Charlie's new smocked dress with Beauty and the Beast Belle embroidery. 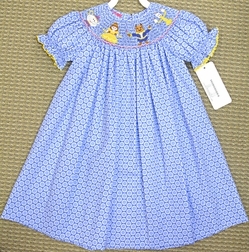 The dress is made of blue fabric with light blue and white dots. It is trimmed with yellow ric rac. The smocking is hand embroidered with Mrs. Potts, Belle, the Beast and Lumière. Cute as can be!